The best viewing time for the Eta Aquarid meteor shower will probably be tomorrow (Thursday) morning, from about 3:00 a.m. until dawn. Our sky chart shows the sky scene just before the onset of morning twilight. 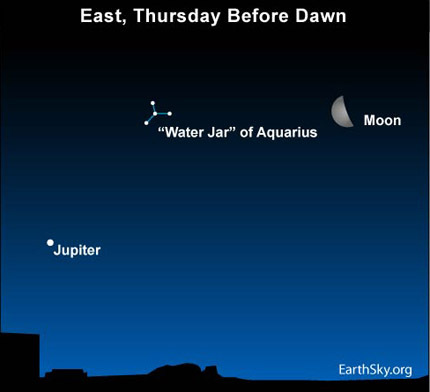 The Y-shaped “Water Jar” peeks out in between the last quarter moon and the blazing planet Jupiter. Incidentally, this distinctive Y-shaped pattern of stars closely aligns with the radiant point of the Eta Aquarid shower. For more on the Eta Aquarid radiant, see our May 4 program. In a dark sky, the Eta Aquarids can produce up to 20 to 40 meteors per hour. But 2010 is not a particularly favorable year, as moonlight will wash away a good portion of this annual predawn meteor shower. Diehard meteor buffs will be on the lookout anyway, because these swift-moving meteors frequently leave persistent trains. In other words, some of these meteors should be bright enough to withstand the moonlit glare. This meteor shower favors the southern hemisphere, and the tropical and subtropical latitudes in the northern hemisphere. Appreciably north of 40 degrees north latitude (the latitude of Denver, Colorado), streaking meteors remain few and far between. The early morning twilight at far northern latitudes washes these Eta Aquarid meteors from the sky. At this time of the year, morning twilight comes at a later hour to the southern latitudes. Once again, the best viewing time is roughly two hours to one hour before sunrise. Unsure of your sunrise time? Or when nautical twilight begins? Check our almanac page. No matter where you live, the last hour of darkness just before dawn tends to feature the greatest number of meteors. While you are out watching the Eta Aquarids streaking the night, check out the dazzling point of light low in your eastern sky around dawn. That is the planet Jupiter, which outshines all the stars visible in the night sky – but which is not as bright as the planet Venus, which beams in the west right after sunset. Data gathered by the International Meteor Organization seems to suggest a possible connection between Jupiter’s 12-year orbit and the intensity of the Eta Aquarid meteors. Given that Jupiter causes the Eta Aquarid meteor shower to put out a maximum number of meteors in 12-year periods, astronomers anticipate that the years 2008 to 2010 may present increased numbers of Eta Aquarid meteors. However, this year, the moonlit glare will wipe out many Eta Aquarid meteors. Previous Story: Can you rescue one of these dogs? Site contents copyright © 2019 Recorder Online	except as noted. All rights reserved. | 88 queries in 2.221 seconds.